"I've ended payments to Guatemala, to Honduras and El Salvador. No more money is going there anymore," Trump told reporters at his estate in Mar-a-Lago, Florida on Friday night. Speaking like the political gangster he is, the US president declared, "We were giving them $500 million. We were paying them tremendous amounts of money, and we're not paying them anymore because they haven't done a thing for us." Trump has also threatened to close the US-Mexico border this week if Mexico does not use force to stop immigrants from Central America passing through the country to reach American soil, where they seek to file claims for asylum status. Such an action would have incalculable consequences, not just for Mexico, but for the United States, Canada and the entire world economy, since US-Mexico cross-border trade now tops $550 billion. Major US industries such as auto would shut down within days if the supply of components produced in Mexican supplier plants was cut off. Late Friday, the State Department issued a statement declaring: "At the secretary's instruction, we are carrying out the president's direction and ending FY 2017 and FY 2018 foreign assistance programs for the Northern Triangle. We will be engaging Congress as part of this process." Officials at the State Department and the US Agency for International Development were ordered to "redirect" assistance "away from these countries" and "cease and desist" all current spending. It is estimated that $500 million of the $620 million currently being expended in the three countries would be affected. The money pays for development and humanitarian assistance, as well as anti-gang efforts by the police of the three countries. Trump made his decision only one day after his secretary of homeland security, Kirstjen Nielsen, signed a border security agreement with the governments of the three countries aimed at boosting the coordination of efforts against narcotics trafficking and undocumented immigration. The timing only underscores that Trump's action was largely driven by domestic political considerations and the need to continuously incite his ultra-right supporters with new acts of aggression against vulnerable and persecuted people. Press reports suggested that the trigger for the action was internal reporting by the Department of Homeland Security (DHS) about the sharp increase in the number of migrants taken into US custody in February, some 76,000, with projections of a further increase to 100,000 in March. Nearly all the immigrants are family groups fleeing Central America who cross the US-Mexico border and apply for refugee status, seeking asylum in the United States from the threat of violence in their home countries. 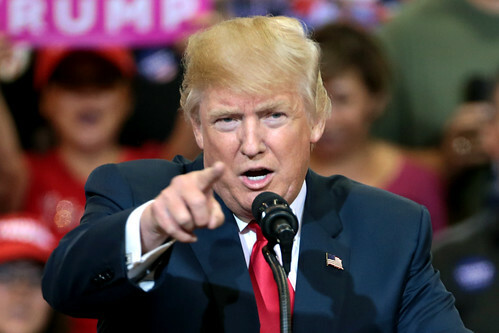 Trump defended both actions with vitriolic attacks both on the governments of the countries involved and on his Democratic Party opponents in the United States, although the Democrats share his goal of halting mass migration from Central America, only differing on the best means to accomplish this. A delegation of leading congressional Democrats was actually in El Salvador on Saturday when the State Department began to implement the aid cutoff, including Eliot Engel, chairman of the House Foreign Affairs Committee, and Jerrold Nadler, chairman of the House Judiciary Committee. They were pressuring the Salvadoran government to do more to curb the movement of migrants. The delegation called the administration's move "counterproductive" and said they would "do everything in our power to push back on the president's misguided approach to Central America." The Democrats share responsibility for the desperate conditions of poverty, police repression and gang violence that plague the so-called Northern Triangle of Central America. It was the Obama administration, in an action spearheaded by then-Secretary of State Hillary Clinton, which backed the 2009 coup in Honduras that overthrew the elected government of President Manuel Zelaya and installed the current right-wing regime. The top Democrat on the Senate Foreign Relations Committee criticized the aid cutoff on the grounds that Trump was undercutting the interests of American imperialism in the region. Senator Robert Menendez said, "If carried out, President Trump's irresponsible decision to cut off our assistance to El Salvador, Guatemala and Honduras would undermine American interests and put our national security at risk." He called for "doing our part to help stabilize the situation in the Northern Triangle and stem the flow of children and refugees to our borders." Given the vast economic consequences of a border closure, Trump's threat to shut the US-Mexico border next week has been generally dismissed by the media and congressional leaders as rhetorical bluster. There was no official statement, only a Twitter declaration: "If Mexico doesn't immediately stop ALL illegal immigration coming into the United States through our southern border, I will be closing the border, or large sections of the border, next week," Trump said. Department of Homeland Security officials indicated that none of the vast logistical preparations required for a full-scale border closure -- including the redeployment of thousands of Border Patrol officers from entry ports to the unpatrolled areas of the border -- was taking place. However, White House acting chief of staff Mick Mulvaney, appearing on Sunday television interview programs on ABC and Fox, reiterated the threat. Meanwhile, the DHS is demanding additional funds and legal authority to imprison the thousands of new refugees crossing the border and seeking asylum. DHS Secretary Nielsen sent a letter to Congress March 28 seeking legislation to permit the DHS to deport unaccompanied children to Central America, rather than holding them in detention centers in the US or releasing them into the country. DHS can currently do this for unaccompanied minors from Mexico, but not from countries further south. Of course the hundreds of millions going there wind up in the pockets of the ruling junta's and are used to finance security and police forces who must be oppressing the people mightily as they so desperately want to leave those countries. Cutting off finances will probably cause some starvation though and maybe cause many more millions to escape north trying to get to U.S. The new flood of refugees will no doubt bolster Trumps claim for the need of a wall to stop them. Damned if you do or don't.